In first year we concluded our amazing journey to the Stone Country... the place incidentally where some of my Aboriginal students come from... they may want to tell us more.... This novel is a must read for all because it really challenges us to rethink our values, our way of life... it tries to open us to new ways of thinking and feeling. In third year we began our adventure with William Blake's poetry after a long 5 week introduction... so this week we were in the world of Innocence and Experience and also in the world of Blake's radical challenge to the philosophies of his day: All Religions are One.. he declared... and There is No Natural Religion... we wrestled with these ideas... and will continue to do so for a few weeks yet. I’m trying to work something out that seems a bit anachronistic. I think someone may have figured this out before, or it might be common knowledge to Blakian scholars, but I can’t find any references in the Blake archive, online, or in my books on Blake. 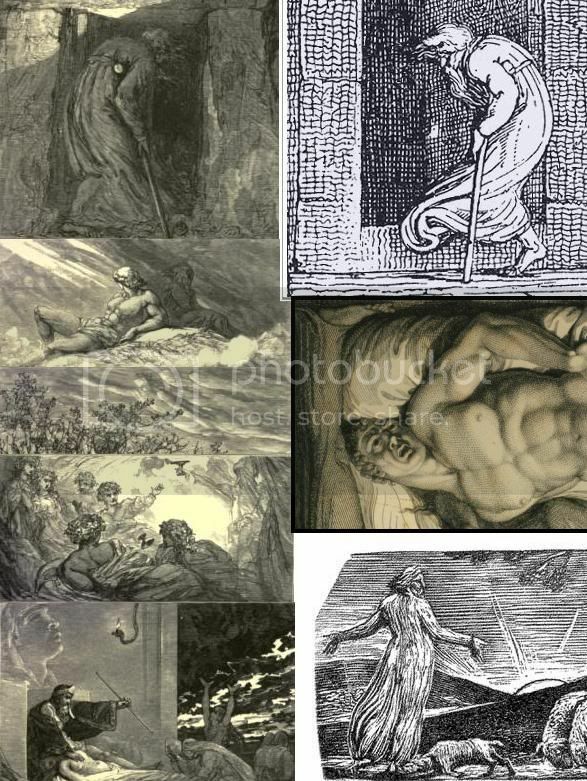 Is it possible that the images in the left are Blake’s, have you seen them before, and if so do you know their source? On the right are a couple of images that I think link the two, but the publication date doesn’t make sense. Blake was long dead before the book first went into print, and for all purposes, the publisher's note seems to indicate the engravings were done for the book.